Veterans make better students than many people think—including veterans themselves, said two experts from a leading student-veteran group in a stats-filled presentation at Rose Hill campus. But with the right supports in place, colleges and universities can help them get past that perception, they said. 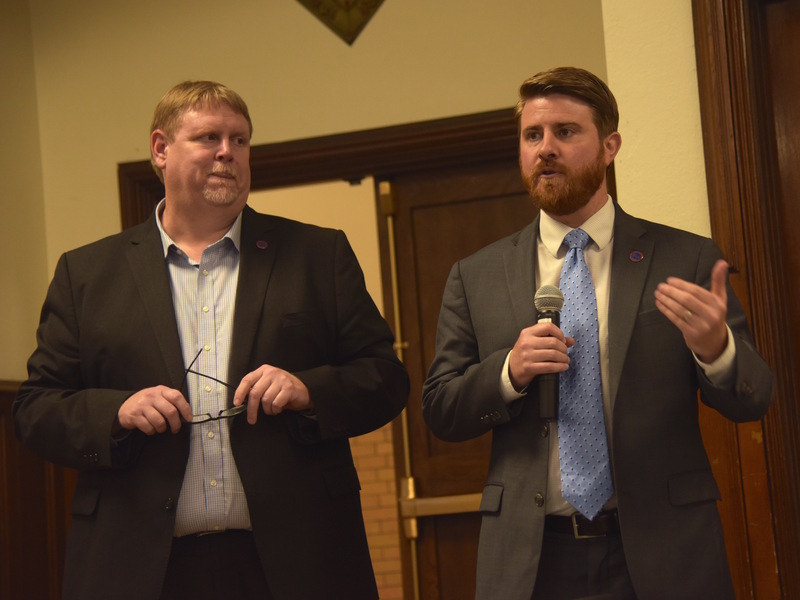 On Nov. 2 at Keating Hall, the Fordham Veterans Association hosted two executive leaders from Student Veterans of America (SVA), a nonprofit organization that aids more than 1,500 colleges and 700,000 student veterans across the country. 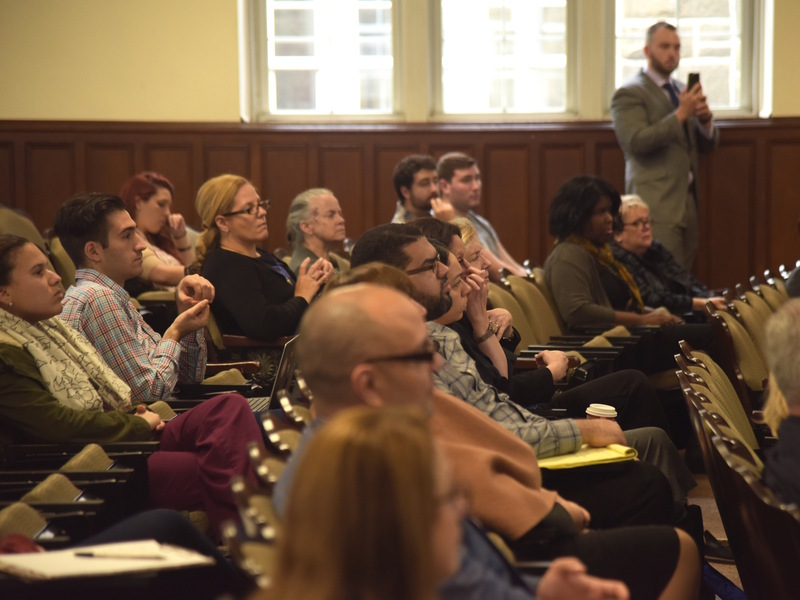 James Schmeling, SVA’s executive vice president, and Jared Lyon, SVA’s president and CEO, gave a talk geared toward faculty and staff at Fordham, which is home to around 500 student veterans and veteran dependants. The day’s lecture was a personal topic for many in the room, including Matthew Butler, PCS ’16, director of Military and Veterans’ Services at Fordham and a former Marine, and the two guest speakers—both of whom are first-generation college students who served in the military. And, said Butler, who introduced the talk, it was also a chance to remember Fordham’s veterans who died nearly a century ago. “I would be remiss if I didn’t take a moment to draw your attention to the armistice signed on November 11, 1918—a hundred years ago. I draw your attention to the armistice because of the men from Fordham University who joined the fight in Europe during World War I,” Butler said. 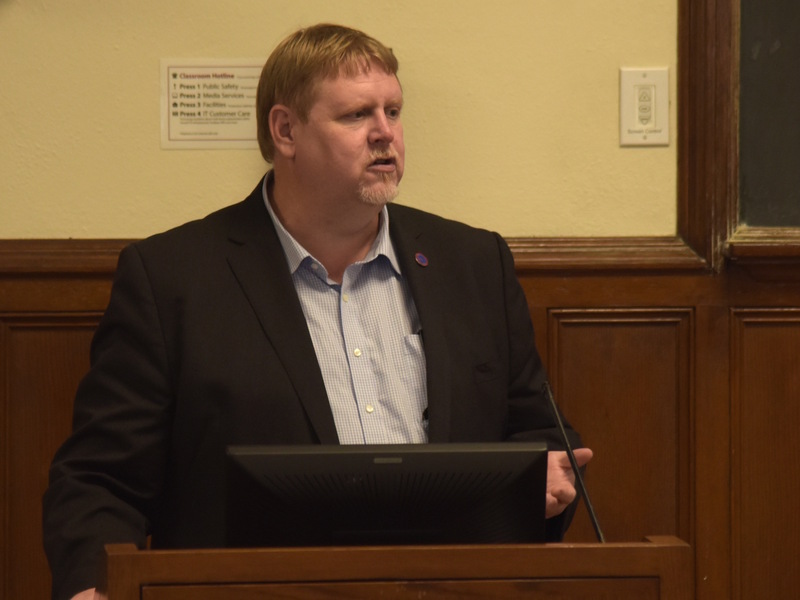 Schmeling spoke about the post-9/11 veteran population, their challenges with returning to civilian life, and how colleges and universities can benefit from having veterans in their student body. These veterans face a variety of challenges when they leave the military: navigating their veterans benefits, finding a job, acclimating to a non-combatant life, struggling with finances, and understanding how to apply their military skills to their new jobs, Schmeling said. But they’re also better students than most people might imagine. On average, post-9/11 veterans achieve higher educational attainment than earlier generations and the general U.S. population, he said. Forty-one percent of post-9/11 veterans have a college or associate degree. On the other hand, only 28 percent of the total U.S. population have that same level of education. Many student veterans are well-educated, Schmeling said—but most people don’t think they are. “I’ve just given you the data and the facts,” said Schmeling, who sourced statistics from the Bureau of Labor Statistics, the U.S. Department of Veterans Affairs, the U.S. Census Bureau, journal studies, and information collected in a collaboration between SVA and the Institute for Veterans and Military Veterans at Syracuse University. Then he paused. Schmeling addressed common perceptions held by veterans, non-veterans, employers, educators, and military spouses. He showed the audience several bar graphs from the 2018 Veterans’ Well-Being Survey, a study of more than 4,500 veterans and non-veterans conducted by Edelman Intelligence, a global communications marketing firm. Majorities from each population indicated that that they think veterans are more than or equally likely to obtain a bachelor’s degree as non-veterans, he said. However, the same is not true for advanced degrees. A whopping 70 percent of military spouses said they believe military veterans are less likely than the average citizen to obtain a degree ranked around a Ph.D. He also noted that 53 percent of employers believe that, compared to non-veterans, most veterans do not have successful careers after they leave military service. And barely half of veterans themselves believe that the majority of veterans have successful careers post-military service. But student veterans have both facts and data on their side. They’re not only college material—they’re an asset to college classrooms, Schmeling argued. First off, student veterans aren’t likely to incur much debt. As of May 2018, the post-9/11 G.I. Bill/ Yellow Ribbon program has funded $75 billion for veterans’ tuition, fees, book stipends, and housing allowance, he said. Fordham’s commitment to the Yellow Ribbon program guarantees that all tuition and fees are fully covered for admitted eligible veterans. Student veterans also bring diversity in age, ethnicity, marital status, and disabilities. In addition, they possess military-honed skills that can transfer to their studies and future jobs: work ethic and discipline, mental toughness, teamwork. And on average, he added, student veterans have a higher GPA than traditional students at four-year-degree-granting institutions nationwide. Veterans typically do best in colleges and universities that have a good peer support system, advisors, and networking opportunities, Schmeling and Lyon said. “The number one thing we can provide a student veteran—if you give them this one thing, they’re three times more likely to graduate than anything else—shocks a lot of people. It’s a peer. 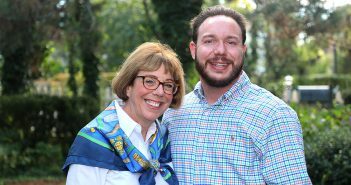 It’s a friend—someone you can relate to firsthand in that college environment,” Lyon said. Schmeling added that many student veterans he’s spoken with, especially first-generation college students, had no idea they could graduate from college after serving in the military. 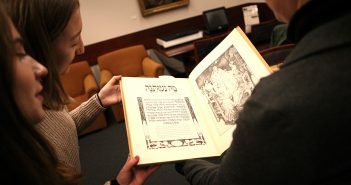 Anna Ponterosso, university registrar and director of academic records, said she found the lecture to be informative.